Yes! There is a super power for fashion retail and e-commerce! Over the last few weeks chatbots have become the superpower to build a super customer service and engagement for retailers and e-commerce. A few of the most popular bots have been implemented for well known brands. Bots take a similar approach in saying hello or asking YES or No questions in order to put a user at relevant fit products. While chatbots offer a scalable and inexpensive conversation between a brand and their customers, they are still missing one feature — they can only chat(more info later)… A Bot definitively should do more work than answer basic soulless questions. Bots needs provide an opportunity to help customer find exactly what they want or they could advice on where we can buy things — the most important thing in business called Purchase Decision. They will start to serve as a way to more conveniently connect with the customer encouraging a long term personal relationship and because of the ease of purchase, to keep them coming back for more and more. There isn’t a retailer or e-commerce yet who can answer this automatically via artificial intelligence. That is exactly where SnapShopBot image recognition Bot comes in. Our technology is powering chatbots to be able to speak images. This is a totally different level. 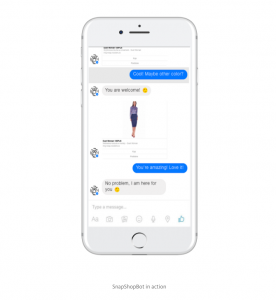 The combination of chatbots current technology with SnapShopBot visual search and AI is bringing the shopping experience to the next level. It goes way beyond matching similar products based on color or shape. Our technology is capable of recognizing the style of a product and the entirety of the outfit to deliver products that will convert. Moreover, this technology can reach far beyond retailer’s or e-commerce’s smart minds. It has huge potential to make closed content platforms like Instagram or Snapchat shopping.